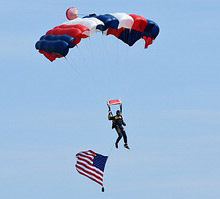 The Rhode Island Open House & Air Show 2018 at Quonset Point, North Kingstown, hosted by the RI National Guard took place on June 9-10. Photo report by Dave O'Brien from Friday's practice and Saturday's show. It was another great weekend for an air show in Rhode Island. The weather was beautiful Saturday morning, temperature in the low 70s °F (20s °C), nice breeze and clear blue skies. A C-130J Hercules from the resident 134th Airlift Wing took off first with the US Navy Jump Team. This was their first time jumping at the Rhode Island Air Show. 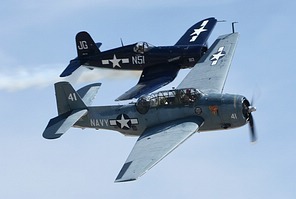 While they did their climb, the TBM Avenger and FG-1D Corsair II performed some fly-bys. Greg Colyer flying the T-33 "Ace Maker" went up next for a short teaser. 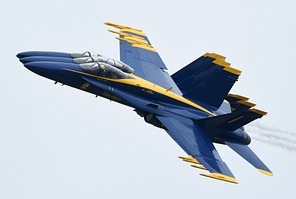 as his full routine was planned for the afternoon right before the Blue Angels. The GEICO Skytypers went up next, it was tough seeing they just lost a pilot a week prior in a crash in NY. The 134th AW presented their C-130J two-ship demo. They dropped a crate to mock a supply drop and then the second Hercules landed, dropped off a HMMWV and took off again. The next demo up was the one I was so excited about and really made the air show for me. 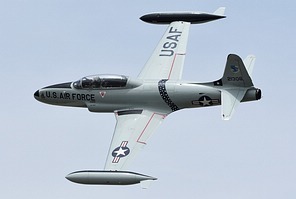 The USAF Heritage Flight was always scheduled to be part of the show. It was going to be the F-35 Lightning II piloted by Capt. Andrew "Dojo" Olson and a P-51D Mustang flown by Andrew McKenna. However there was a late addition of the F-16 Viper Demo to the show, piloted by Maj. John "Rain" Waters. He came in late on Friday so he had to practice his demo after the Blue Angels landed. The F-35 Lightning II went up with him then and they made multiple passes. 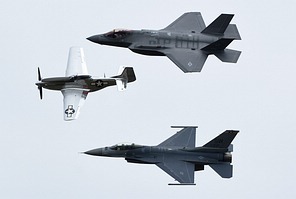 On Saturday they stuck to their Heritage Flight demo of three passes after the F-16 demo was finished. 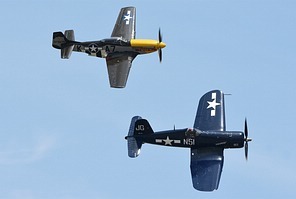 Mark Murphy flew his P-51D Mustang "Never Miss" with the FG-1D Corsair, flown by Charles Lynch. Then came the Shockwave Jet Truck, which was followed by Michael Goulian, Sean D Tucker. 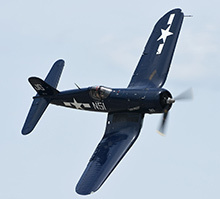 This is Sean’s last year performing at air shows the announcer stated. Greg Colyer went back up with his T-33 for the full display, and then it was time for the Blue Angels. 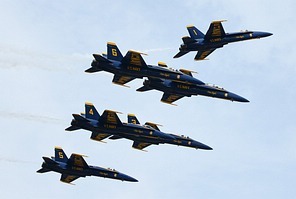 The Blue Angels did not have "Fat Albert", which was ground for maintenance issues. Because the clouds rolled in around noon, the Blue Angels had to do their low show. Still a lot of speed, but not much vapor in these conditions, which was a letdown. The next Rhode Island Open House & Air Show is scheduled for June 29-30, 2019, featuring the USAF Thunderbirds. Thanks so much to the 143rd AW PAO for allowing me the media access on Friday and for putting on a great show.